WILL LUTHER BE THE NEXT CANONIZED ‘SAINT’? - When I read about the jubilant commemorations that the Conciliar Church will sponsor together with the Lutheran World Federation at the end of October in Sweden, I wondered whether Francis is preparing to surprise the world by canonizing the revolted monk of the 16th century as another manifestations of his “mercy.” Indeed, after he has canonized immorality and Woodstock lifestyle with Wojtyla, has beatified homosexuality with Montini and enshrined religious indifferentism with Teresa of Calcutta, why could he not canonize heresy – blatant and furious heresy – with Luther? Will Luther, Calvin & Zwingli be declared 'saints' by the Conciliar Church? Let us not forget that in 1999 Card. Raztinger, today Benedict XVI, was the one who penned the Catholic-Lutheran Augsburg Accord (here and here) on the doctrine of justification, which saved the ecumenical relationship with the Protestants from a complete shipwreck. These are data from the past that speak in favor of a sensational gesture that could come from Francis regarding Luther either this October or sometime later. So, 51 years after the closing of Vatican II, the Conciliar Church has infiltrated the Catholic Church so forcefully that the teaching of the Council of Trent and the First Vatican Council, which uniformly reflect the perennial mind of the Church, were changed so radically that today Martin Luther, the heretic per antonomasia, is accepted as a great model to be followed. His act of revolt will be celebrated by a conciliar Pope in a public act before the whole world. Does this not incline one to conjecture that Luther can be declared a “saint” of this apostate Church next month or sometime soon? Who cannot see all these festivities as a clear proof that this Church hardly has anything Catholic in it? Cf. Jan Willebrands, “Lecture delivered at the 5th Assembly of the Lutheran World Federation, July 15, 1970, La Documentation Catholique, September, 6, 1970, pp. 765-766, apud Quo Vadis Petre?, Los Angeles: TIA, 1999, pp. 17-20. John Paul II, Letter to Cardinal Willlebrands of October 1983, published under the title “La verità storica su Lutero alimenti il dialogo per unità,” L’Osservatore Romano, November 6, 1983, apud ibid. pp. 21-22. J. Willebrands, Speech about Luther at the St. Nicolas Institute of Bari, published under the title “Il Card. Willebrands inaugura il corso dell’Instituto S. Nicola,” L’Osservatore Romano, February, 5, 1984, p. 6, apud ibid. pp. 20-21. Cf. Tertio millennio adveniente (1994, § 37); Ut unum sint (1995 § 48). The Tablet, September 3, 2016, p. 26. 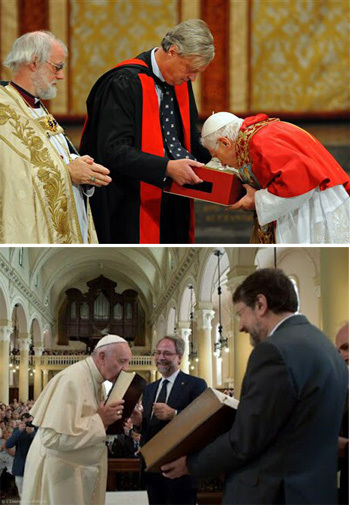 Francis' Utopia of Poverty & His Heretical "Brothers"